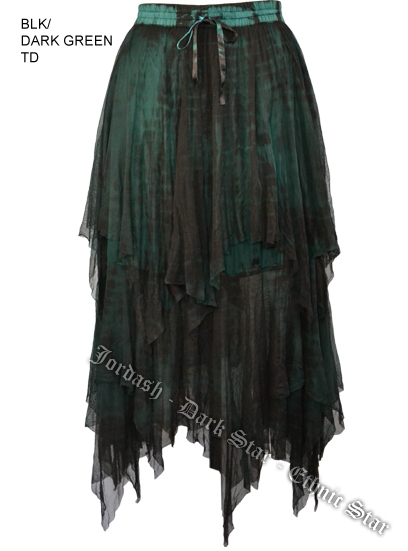 Dark Star Gothic Black and Green Dark Lace Net Multi Tier Witchy Hem Skirt [DS/SK/5607DGreen] - $58.99 : Mystic Crypt, the most unique, hard to find items at ghoulishly great prices! Dark Star Gothic Black and Green Dark Tie Dye Lace Net Multi Tier Witchy Hem Skirt. This skirt is beautiful and very witchy. Made of Net layered lace long tiered skirt. Knee length lining with long zig zag net trim. Elastic Waist band with a string/ribbon. Very adjustable waist band. This skirt is fully lined to 18 inches. The georgette witchy zig zag hems are at 26 inches and 37 1/2 inches full length. The bottom below the lining is slightly see thru. 100% Nylon. Please read measurements carefully!